Thanks to John Henderson for sending this into us. Early Christian Scotland, 400 to 1093 A.D., by the Rev. A. K. H. Boyd, D.D., First Minister of St Andrews. Mediaeval Scotland, 1093 to 1512 A.D., by the Rev. James Campbell, D.D., Minister of Balmerino. 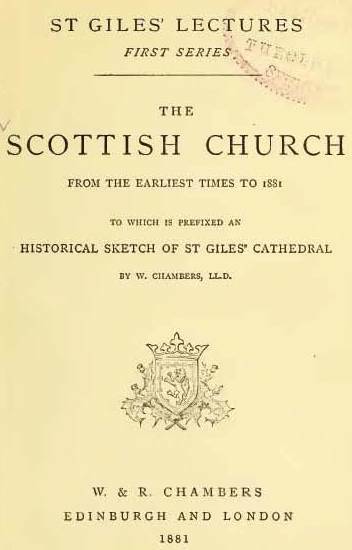 Pre-Reformation Scotland, 1513 to 1559 A.D., By the Rev. Alexander F. Mitchell, D.D., Professor of Ecclesiastical History in the University of St Andrews. Episcopacy, Presbytery, and Puritanism in Scotland, 1572 to 1660 A.D. By the Rev. John Cunningham, D.D., Minister of Crieff. The Covenant, 1660 to 1690 A.D By the Rev. Robert Flint, D.D., LL.D., Professor of Divinity in the University of Edinburgh. The Church of the Eighteenth Century, 1707 TO 1800 A.D., By the Very Rev. John Tulloch, D.D., LL.D., Principal of St Mary's College, St Andrews, and one of Her Majesty's Chaplains.